PUMA® drives the high emotion of sport into every product it creates. Joy, confidence and determination inspire a fit and functional design, while on-trend fashion and colour directions decorate the look. The new PUMA Eyewear collection inspires the wearer to be stronger, better and faster. 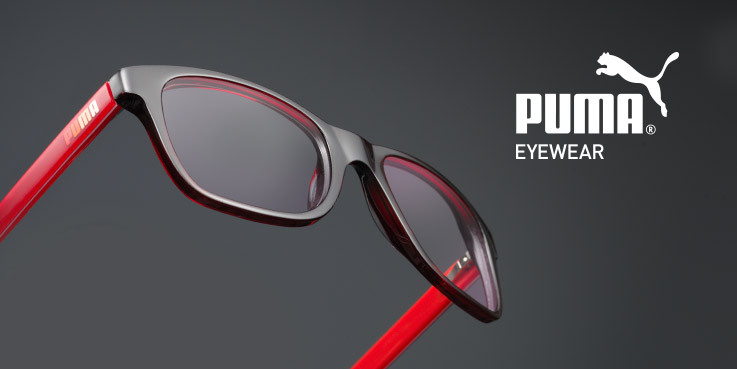 PUMA glasses are just 129 €, including standard single vision lenses, and you can get a second pair free in our great 2 for 1 designer glasses offer. You can even make designer sunglasses your second pair. This tri-coloured, acetate plastic frame features a solid, chocolate brown exterior, a striking bright blue middle layer, and a warm beige interior. All three colours can be seen from the side. 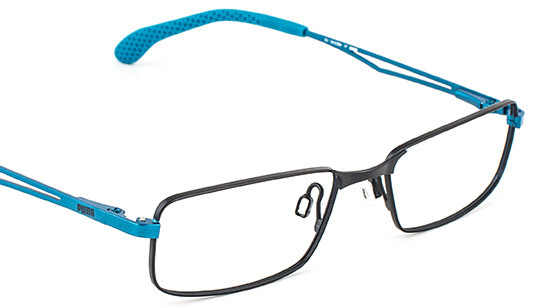 Silicon grip sleeves on the temple create a secure grip, making this frame ideal active sportswear. A fun combination of colour and beautiful design features makes for a stylish, trendy frame. 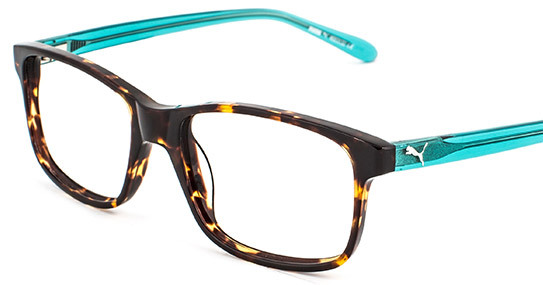 The tortoiseshell acetate plastic front stands out against the crystal, turquoise-green coloured sides. A silver PUMA Cat Logo features near each temple, drawing attention to the contrasting sides that expose the inner-workings of the frame. 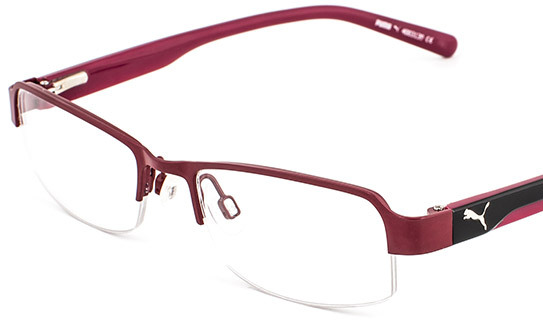 This super hot, vibrant frame is energised with a stunning range of complementary colour tones. 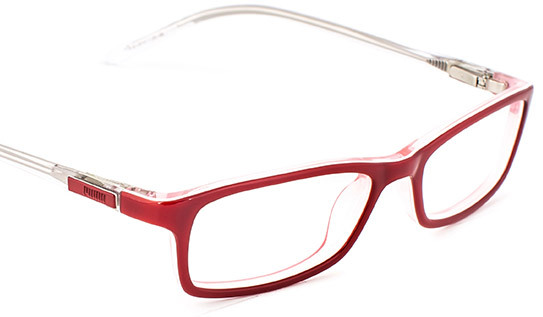 The semi-translucent, deep red acetate plastic frame front is accentuated with a striking, glossy, tri-coloured combination of cherry and muted red, separated by a subtle, white candy stripe. This dark gunmetal, wrap-around, sheet metal frame with silver highlights running across the top has a strong, masculine look. The grey and red dual-coloured, soft-touch temple tips add extra grip for sportswear. This use of colour is similar to combinations used on PUMA trainers and clothing designs. 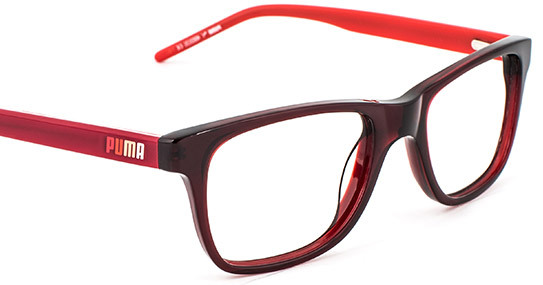 The glossy, rich red acetate plastic frame front signifies PUMA’s energy and speed. PUMA is engraved into a matching, tonal bright red plaque on each side. The silver-coloured interior framework is both functional and a neat design feature that is visible through the crystal sides. A playful, semi-rimless, mixed-material frame. The deep magenta-coloured frame front draws attention to the eyes and runs through onto the sides, while a glossy, black acetate plastic layer forms a streamlined side design. Finished neatly with a shiny, silver PUMA Cat Logo near each temple. A sleek, lightweight design. 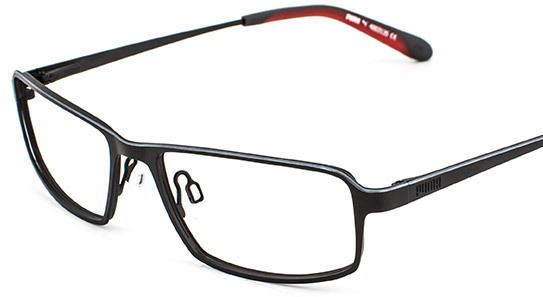 A rectangular-shaped, metal frame with stylish simplicity. 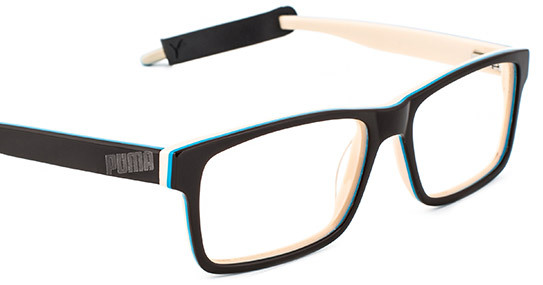 The deep blue front contrasts well with the lighter, iridescent blue sides and acetate plastic temple tips. Distinct textures on the temple tips’ interior and exterior surface mirror patterns found on PUMA trainers.